UDM Downloads > Hot Lines! 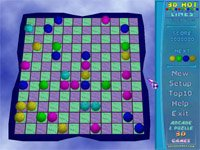 This nice logic game takes place at the board 12x12 with vivid balls. The purpose of the game is to clear the field. The combination of 5 or more balls of the same color disappears. Every failure (no combination was built) brings three new balls at the field. If you manage to delete a color it won't appear any more. To move the ball you should click at it and then click the place where it should be. The ball cannot move to the pointed place only if there are other balls blocking its way and there are no empty squares to pass through. There are two game modes: Arcade Lines (similar to Classic Lines) and Timed Lines (practice your quick reaction. The game includes three skill levels, so you can play forever improving your mastery. The game is completely free, so download and have a lot of fun!